Nintendo's newest console, a combination of a handheld and a traditional gaming console, has been a success, even to a surprising degree one could argue. However, it never was very powerful and technology keep on trotting at a pace that makes Switch supremely obsolete in no time flat. Switch is only 18 months old but it's showing age. The graphics are just not there, if they ever were, and especially with the next generation of Xbox and PlayStation consoles ever closer, Nintendo needs something to keep people buying their devices. And arguably smartphones could be an even bigger threat as they keep evolving and catching the Switch. So no big surprise, Wall Street Journal is reporting about Nintendo's plans to release a new Switch in 2019. 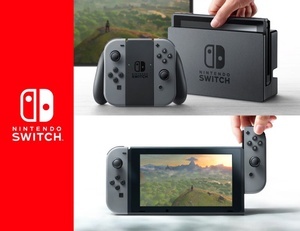 According to the sources the new Switch is slated for late 2019 release but there is not much on what this new version will update. One update could be an improved screen which is definitely not on par with today's technology. Switch has a 6.2 inch 720p LCD screen. Some have argued that Nintendo should give up the living room battle altogether and make the updated switch a handheld only console. This would make the device smaller and/or free up space for improvements in performance.